Many people may wonder why traditional phones are still used with cell phone technology so advanced. But the truth is that wired telecommunication is still one of the most reliable and cheapest options available. To ensure that you find the best cordless phone for your needs and budget we have put together this site, and we believe that you will find what you need. The interactive chart on this page will give you a full overview of the main features of the most popular phones on the market to help you better compare them. Everyone has different needs which means that you should always choose a phone that will give you those features you're going to use most. You can also very conveniently click on the Amazon links and also the links to detailed reviews on this site for a full list of all capabilities. Need information on even more devices? Check out this page, which contains the review table of all the products reviewed on this site. Why Do People Still Buy This Technology? In today’s world of high tech telecommunications most people use cell phones for the majority of their communication. Especially with the arrival of the touchscreen Smartphone like the iPhone and Android based devices, these have quickly become the go-to gadget for telephone calls, sms text messages, email and web browsing. But there are many reasons why people do and should use more “traditional” types. In order to find a great cordless telephone for your needs you should consider the information provided on this site. Wired phone line providers still offer some of the most reliable and cheapest telecoms services. But even beyond traditional landlines there are inexpensive modern technologies that are now fully compatible with a cordless system. The two main voice over IP (VOIP) technologies used by the general public are Skype and Google Voice. Both allow you to make calls, essentially over the Internet, and a lot of those calls are completely free. In the past you usually needed to use your computer to make those calls, but you can now use both Skype and Google Voice with portable handsets that can also be used for incoming calls. When you are looking for a great cordless handset you have to focus on certain features and decide whether you will need them or not. The more features you require the more expensive the system will become, but there really is something for every budget. Many features are only really necessary in a business type environment and should be completely ignored by the average residential home user. Knowing what to look out for will help you make a much better educated decision. Our cordless handset reviews will help you with this! We have analysed and rated all of the most popular options to make sure they really are suitable for different uses. Everything from simple and easy to use to longrange frequency to cover a longer distance is covered. The vast majority of cordless systems will allow you to connect at least 5 handsets. For most families and households this will be enough. Small businesses will also be able to function with 5 handsets, as anything more than that would probably require multiple phone lines, which means a whole different setup. However, before you commit to buying a specific model of wireless telephone you should think about whether your household will increase in size. Also take into account that young children may not use it much, but they will become teenagers at some stage. Once that happens you want to have the ability to expand your cordless handset system. One thing to keep in mind for small businesses is that the majority of consumer based DECT devices are limited to 12 units as a maximum. If you regularly call a lot of different people, then you will need to check how many entries can be set up. Most devices will allow for plenty of numbers to be stored, but in a small business or large household you may want to make sure that you can store enough data. Pretty much all cordless devices today come with speaker functionality. This allows you to use it hands free which can be very convenient when you are trying to do something else at the same time, e.g. typing or taking notes. The speaker is also very convenient if you have multiple people in the same room as you that would like to hear the conversation as well. This would be very common for calls to family, especially for people with relatives and friends that are overseas. But sometimes you require hands free functionality without other people being able to listen in as well. Especially in a business environment multiple speakerphones being on at the same tine can be very distracting. That is where a headset port comes in very handy, as you can plug a headset directly into the hand set in order to use it hands free. This is very important if you use the phone a lot. Some devices will only tell you what the standby time is, but this is not really that useful. What you want to know is how long you can actually use the handset before it has to be powered up again. If you make a lot of calls, then you want to make sure that you can at least get from morning until evening without having to charge it again. 6 hours or more talk time is pretty good, but quite a few cordless devices will allow up to 13 hours of talking. To avoid missing important calls it is very convenient to have an answering machine built into the system. Rather than having an additional separate device it makes sense to just buy a model that has a base unit with a built in answering machine. Just make sure that it has at least 10 minutes of recording time, as anything less will quickly fill up if you are away from your home or business for a couple of days. With the help of this site you will find the best wireless telephone with answering machine. Some of the more fully featured and latest models now come with Bluetooth built in. This allows you to connect to and hook up your cell phone to the system and use the handheld device to make and receive calls over your cell. It's a full digital integration. Most people tend to plug their cell phones in to charge as soon as they get home, and this restricts where you can use it. But if you can hook it up to your home system, then it really doesn’t matter where it is located. The following is a brief overview of the some of the most recommended cordless systems we have found. Each of the devices is reviewed in more detail on this site in dedicated reviews, so you can check out additional info through the links provided. This VTech model is ideal for the home user with a limited budget. The great thing is that even at this cheap price you get more than the most basic features. At a very reasonable price you get two handsets with one base unit. This means that you can have one line coming into the house and have both handsets linked to the one base unit. This gives you great flexibility and the ability to have a device in more than one place in your home. Compliant with DECT 6.0 technology, you will be able to make calls that are interference free with secure encryption meaning that it is practically impossible to eavesdrop on your conversations. Many systems used to suffer from quite a lot of interference from microwaves, cell technology and WiFi communications. But even with this entry level system you will not suffer such problems. This particular telephone system can be expanded up to 5 handsets, which allows you to add on more devices as your family grows. Especially when your kids get to the age where they spend most of the day on the phone to friends you will not be left searching for a handset throughout your home. It is no secrete that kids and especially teenagers have an incredible ability to hide devices. You can also use the phone system to make internal calls, just like an intercom system. This is great way to avoid shouting through the house to get the attention others. In addition, the VTech CS6419 allows you to transfer and conference calls among the handsets you have set up. Panasonic has long been one of the top makers of cordless phones, and at the budget end, this is one of the best systems you can buy. This particular set comes with two handsets and the base unit which can also be used as a phone. The base unit is also where the answering machine is set up, so you can directly check any messages on the base unit. One of the really cool features is the talking caller ID. While most telephones will display the number of the person calling, and possibly the name if stored in your phone book, this particular model uses text-to-speech technology to tell you who is calling in between the rings. A pretty cool feature that means you don’t even have to find it to decide whether you want to answer the call. This system can also be expanded to 6 handsets meaning that as your household grows you will not end up searching for handsets hidden in different bedrooms. The more people that tend to use one system the less likely you will be to find a handset when you need. In addition, you can always use the base unit to make a call. This is probably the best option you can buy to give you a combination of great features at a reasonable price. Another excellent feature is the sound both in the ear piece and speaker. You can expect the highest quality. With this system Panasonic bring you some incredibly great and the newest features. It is fully set up with the latest Bluetooth technology which allows you to pair the base unit with up to two cell phones. This means that when you are at home, any incoming cell calls are redirected to the handsets. Most people tend to plug their smart phones straight into a power source to charge when they get home, meaning that it isn’t always conveniently available. But this no longer is a problem as your home system will simply direct the calls to your cordless handsets as long as it's in range. It also comes with a fully functioning answering machine on the base unit which means that you can conveniently check any messages you receive. And with interference free communication technology you do not have to worry about the quality of calls deteriorating. Built into the handset systems you also have the intercom feature, which is very handy in large homes or multi story homes. No more need to shout through the house to have kids come for dinner, simply dial their handset. Of all the devices available you probably won't find another one as thin as this which is quite unique in this market. AT&T is on of the main providers of mobile and fixed line telecommunications, so it is no surprise that they also make some pretty good communications devices. The CL82309 is one of the best value devices available for the home user, and even small business. For less than $70 you get a total of 3 handsets, and you are able to expand the system up to 12 handsets, which is ideal for small businesses or large families. For a small business 12 handsets is probably a reasonable amount of devices. This allows you to conference multiple people together and even include incoming calls into an internal conference. For this low price there is really not much competition and it give you great flexibility to expand the system as it grows. If you need more than 12 handsets, then it is quite likely that you will require a more professional cordless phone system. You also get an answering machine built into your base unit, which makes it very easy to allow people to leave messages when you are not available. Retrieving the messages is also very simply to do and at the touch of a button you can listen to your messages as soon as you get in the door. With all the handsets having a speakerphone feature you can even use it hands free when you are busy doing other things at the same time. The standard range is very good, but if you have a large house or you'd like an extended range to your garden, then there are add-on devices that can help with this. This combination of corded and cordless phone is ideal for people that require a bigger display and a desk phone, maybe for a home office. Both the base set and handset come with speakerphone features, meaning that you can use the device hands free at any time. You can expand the system up to 5 handsets, which means that it can grow as your needs require. If your business or household expands, you can easily purchase additional handsets and simply link them up. With 12 hours of talk time on the handset, even the most talkative teenager or busy business person will not run out of battery power too quickly. The messaging system is extremely convenient, as you can check any messages left wither on the base set or on any of the handsets. In addition, you can check any voice recordings remotely by dialling into the system. This is very handy for when you are on vacation or have a business that takes you out of the office on a regular basis. Simply ring your phone and navigate the messaging system to securely access the recordings. This will greatly reduce the time between a message being left and then answered by you, which can make all the difference in a business environment. One part of the population that probably uses cordless land line phone the most is elderly people who have not adapted to mobile technology. It's something seniors are more comfortable with and the good news is that there is technology available to help. 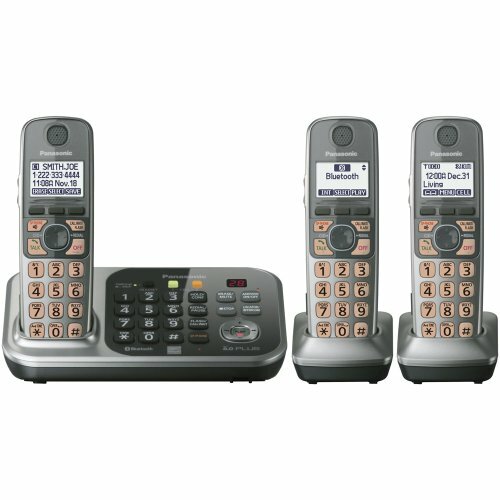 Check out our page on cordless phones for seniors to find out more details.